As you can see, the XH2.54 connector has been moved to the right side, and the IC and crystal are moved to the center now. All USB ports and pogo pins are not changed. The sizing, functionality and pricing of the device are the same between two revisions. We have the new revision in stock. If you order Zero4U (for V1.3) now, you will get the new revision. 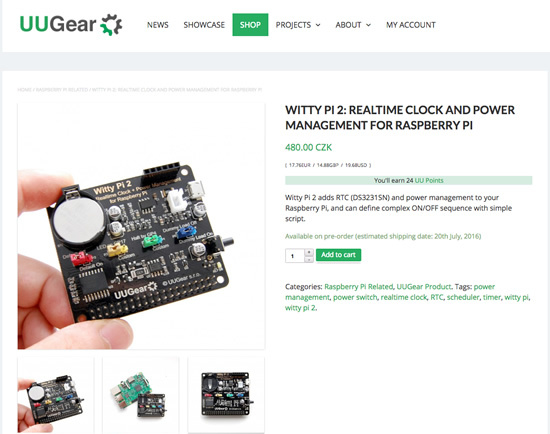 Witty Pi has been in the market for more than a year, and it got public praise at the first place. By integrating realtime clock and power management into one board, it allows defining complex ON/OFF sequence with simple script, which is very welcome by users. Today we go a step further, and announce the new generation of Witty Pi: the Witty Pi 2. Both boards have exactly the same size. The two pictures are with slightly different scale, that’s why Witty Pi 2 looks bigger. As you can see, both boards are quite similar. The switch and micro USB connector are not moved in Witty Pi 2, so the acrylic case will still fit. The obvious differences are the jumpers, there are 4 colorful jumpers now. The newly added blue jumper is to enable/disable the pulsing dummy load on board. If you are using power bank to power your Witty Pi 2 + Raspberry Pi, you may need this pulsing dummy load to keep your power bank alive without drawing too much current. Also you can see a new 6-pin female header on the top-right corner. This header breaks out some important signals (+5V, LED, RTC_INT, Vbat and Switch) on the board, which makes integration with other boards become easier. You can also use this header to connect an external switch (physical or electronic) to control your Witty Pi 2. Driving an external LED is also an easy work now. There are some improvements that could not be found in the picture too. Witty Pi 2 doesn’t use the TXD pin any more, hence using serial port for (huge) data transaction will not have any problem in Witty Pi 2. Also the famous “dead lock” problem, which is caused by ungracefully power off, is now solved at hardware level. 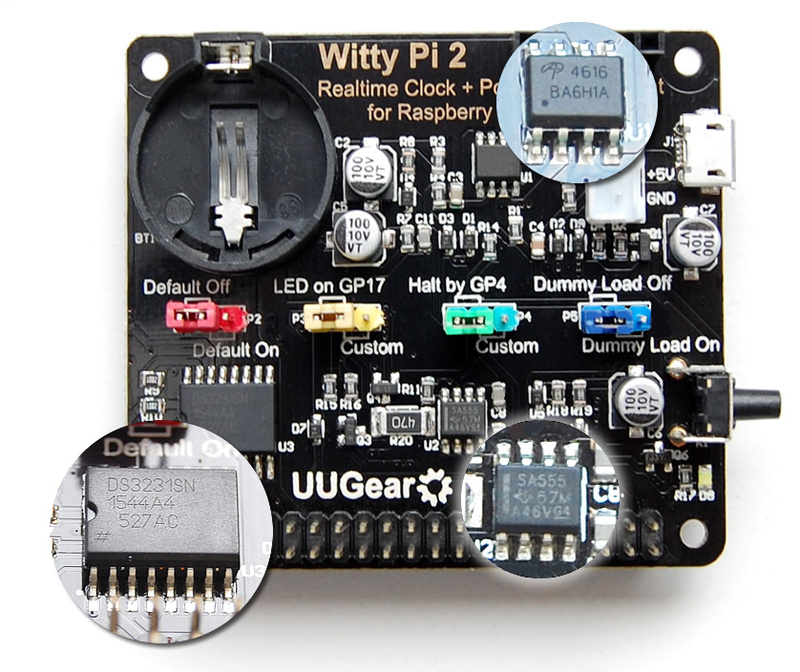 Without the possibility of “dead lock”, Witty Pi 2 has much better reliability than the old Witty Pi. Also the battery life has been extended a lot, thanks to the low power consumption of the new DS3231SN chip, which only draws about 3uA current from the battery, when no power supply is connected. It is quite safe to replace Witty Pi with the newer Witty Pi 2, since Witty Pi 2 has the same interface with Witty Pi, and Witty Pi 2 can even work on Witty Pi’s software (but not the reverse). Comparing to the old Witty Pi, the material cost of Witty Pi 2 has been significantly raised, mainly due to the high price of DS3231SN chip. As a result, we have to raise Witty Pi 2’s price to 480 CZK per unit (about 17.76 EUR, or 14.88 GBP, or 19.68 USD). 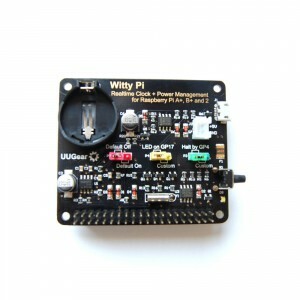 We open the pre-order channel for Witty Pi 2 today, and you can pre-order it in our online shop. We will start the shipping of Witty Pi 2 on about 20th July, 2016. How About the Old Witty Pi? The old Witty Pi is now officially retired. We will not manufacture the old Witty Pi any more, unless our customer request to make a customized batch. 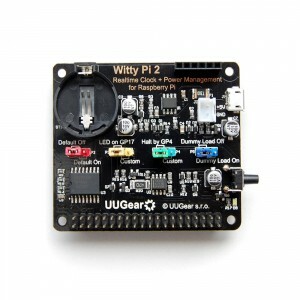 Witty Pi 2 is officially in stock now.